Break through the boundaries of traditional wirework jewelry to discover the world of intricate possibilities in Woven in Wire. As you weave, sculpt, and transform wire, award winning jeweler and wirework instructor Sarah Thompson guides you through the steps of achieving spectacular wearable art. Wire weaving fundamentals and her most prized techniques, helping you become a distinguished wire artist. Mastering form and symmetry as you create ornate necklaces, rings, bracelets, pendants, and earrings. The final steps to becoming a wire-weaving master--dismantling and reassembling the woven components for truly transformative jewelry designs. As you work through the techniques and designs in Woven in Wire, your artistic power will grow, your skills will advance, and you will have the confidence to create your own intricate breathtakingly beautiful designs. 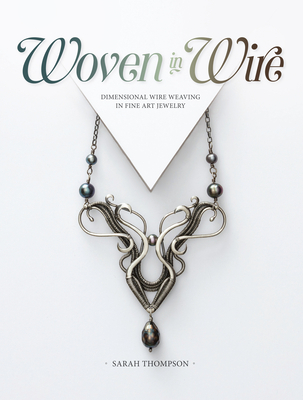 Sarah Thompson took Best in Show and Best in Wirework in the 2014 Bead Dreams Competition with jewelry created using techniques in her first book, Fine Art Wire Weaving, and her follow up, Woven in Wire. She teaches at local bead stores in Spokane and Seattle, as well as other cities around the United States. Sarah thoroughly enjoys sharing her craft with others.